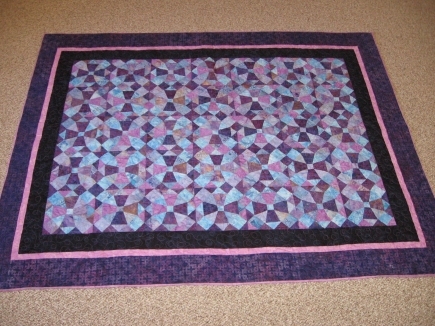 This makes an 8 " block and is paper pieced! It's a late 1800's-early1900's pattern. The first thing that I would recommend that you do, is go to the Practice Paper Piecing Page. 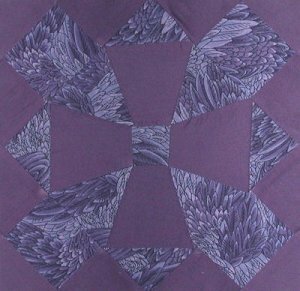 When you feel comfy with paper piecing, come on back and try a Saint Paul Block! You will need to print out two copies of the template A page and one copy of the template B page per block you want to make on very lightweight paper. A Fat Quarter of each fabric is plenty! 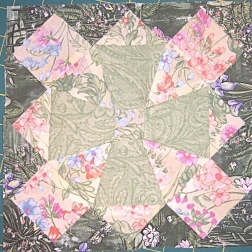 After piecing all units, sew the center pieces as shown at far left, pivoting at the inner intersections. Add the outside corners, and it's all done! This wall hanging is just nine blocks, with a row of piping between the top and wide mitered border! Here's one that Tessa made! Stephanie's! Joyce's!